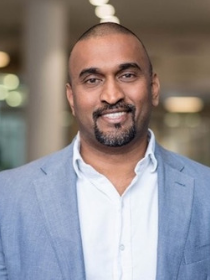 A recognized customer operations professional and technology leader known for crafting the requisite strategic vision to achieve business goals, Roland Naidoo offers a unique blend of executive acumen, team-management, and IT/customer solutions development credited with strong ROI and operational improvement in business. As a the current Head of Customer Operations Support at MultiChoice South Africa, Roland has over the years built a customer-centric, responsive department that has consistently delivered results by aligning technology initiatives with business goals. This has seen substantial improvements to service delivery, standardization of procedures, and business/systems performance. His love for AI and technology is borne of his thirst for human advancement, an enhanced customer experience and global connectivity. It is why he understands the importance of AI and leading-edge technology for the seamless future for any organisation. Over the years, this has been his driving force in ensuring is instrumental in leading innovation and technology applications which are critical to the success of production systems, a refined customer experience and ultimately, improved company performance. One of Roland’s most significant achievements was as a guest speaker at the IBM Watson Summit 2018 where he spoke around the customer experience. Even with the focus on embracing AI strategic solutions in business, Roland is not oblivious to the fact that technology and AI is not the silver bullet for a business’s customer problems, but rather the starting point in building great customer assistance. With this in mind, he successfully shepherds innovative tech strategies with cost accounting improvements bringing relative successes to business management practices and capital expenditures in operations. Roland has honed his skills working and consulting with/at some of the countries and globe’s most reputed organisations amongst them: Nestle, South African Breweries, ABI, Appletiser, Standard Bank, InQuba Customer Intelligence, and at the current MultiChoice, SA where he continues to lead complex systems implementations and applications development projects for prominent accounts. The accomplished innovations executive holds a BSc in Chemical Engineering and an MSc in Engineering Thermodynamics from the University of Natal in Durban. He is also a BP accredited Customer Experience Master. When Roland is not collaborating with his innovators or designing new customer solutions, he can be found learning new skills or re-learning old ones. He tries to learn something new every year, be it painting, photography, playing the drums, guitar or becoming a passable vocalist. Roland is often moved by human excellence and our ability to transcend boundaries and overcome adversity. He believes in the important of always moving forward, and thus catapulting us to human ascension into evolution. Technology is human evolution. It helps us to discover our raison d’être – or reason for being; an inexplicable moment that can only be experienced when we are constantly evolving and applying ourselves as catalysts for change.